Ridango provides various output formats for real-time passenger journey overview information. Real time passenger journey overview means the information on what time the vehicle is arriving. This also provides the information back to the driver whether the vehicle is on schedule or not. APC is technology that has electronic device installation that is installed on the transit vehicle which accurately records boarding and alighting data. This device is in connection with Ridango back-end services and provides APC reports and information to operators and agencies. The APC can be successfully built as a separate stand-alone solutions in connection with Ridango transit ticketing solutions to use partly the same communication channels and interfaces. APC can provide information with different detail levels (which stops people entered and exited, what time, which hours etc). Ridango has successfully built infotainment and wayside screens. Infotainment solutions are screens on vehicles that provide various information that customer has requested. The infotainment on buses can feature advertising, alerts and messages as well as real-time journey information (assumption that RTPI has been developed). Wayside screens are mostly used in connection with real-time journey information that provide accurate timing on the arrivals of next transit vehicle to particular stop or platform. Audio announcements provide vocal real-time on-board information about the present and next bus-stop, connecting lines, etc. Audio announcements are MP3 files, stored in the driver’s console and automatically controlled by it. 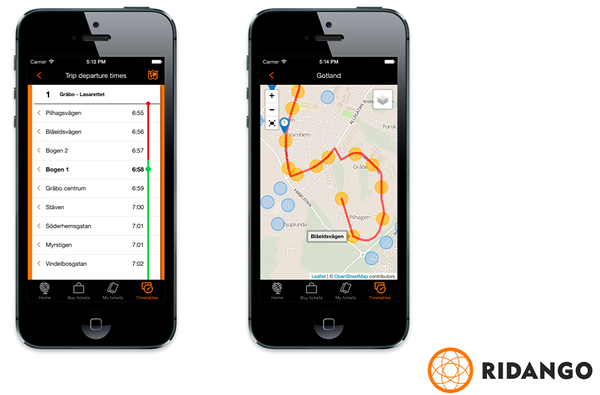 The route data and location information determines, when and where announcements are played. It is also possible to configure announcement settings. The common setting is usually 300 m before present stop, or 50 m after the last stop, if the distance between stops is shorter,. than 300 m.
Also pre-installed vehicle’s loudspeaker system can be used for announcements playback.